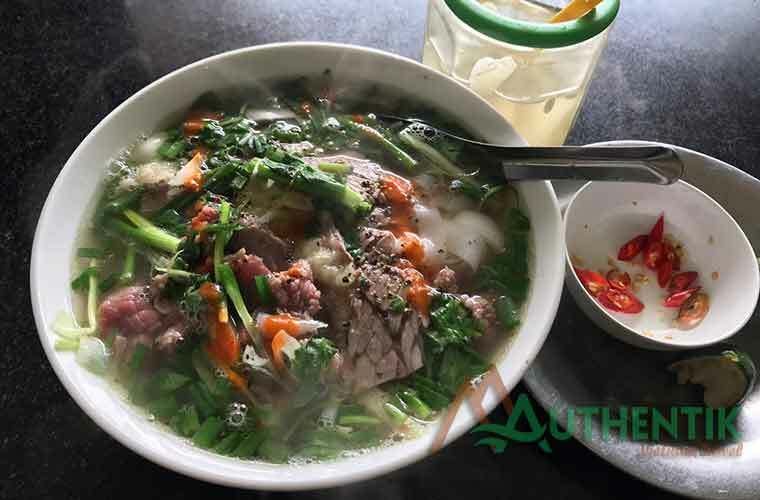 Pho is a special gift of Hanoi, It is not only in Hanoi, but because it is only delicious in Hanoi. A delicious Pho must be a “classic” Pho, cooked with beef and the broth is clear and sweet. The noodle is not crushed, it must be flexible, the meat is crispy, not chewy, enough chilli, lemon and onion. Pho Thin: 13 Lo Duc Str, Hanoi. Open time 6.00 – 20.30. 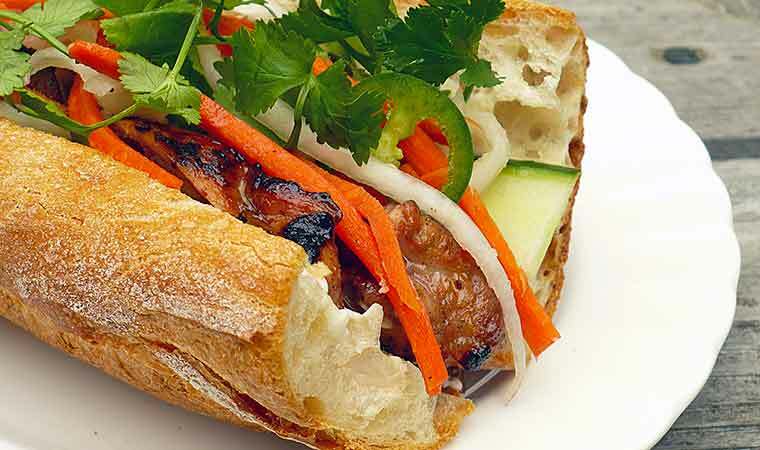 Banh Mi is a dish that appeared from the French period with the combination of rustic ingredients such as paté, eggs, meat…this dish is not picky and everyone could enjoy it. From the children to old people are interested in it. It is not only for breakfast, but also for lunch or dinner and dinner at night time. It will be greater if you have Banh Mi with Soya bean. 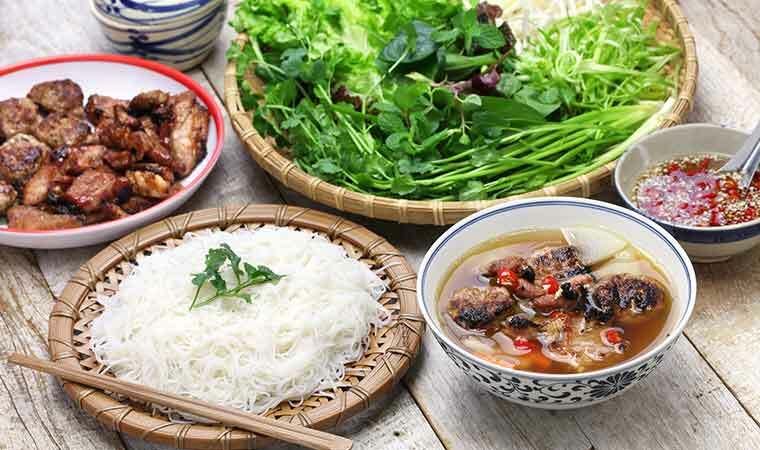 Hanoi grilled pork with rice noodle is a dish that used with a bowl of sweet and sour salted papaw water. The blended meats are grilled by charcoal. Bun Cha is served with fresh herbs, vegetables, ground garlic, chilli that all makes a great taste. If they use the bamboo stick to grill the meat, that will create the special flavor. Bun Cha Huong Lien or Ban Cha Obama where USA president visited and enjoyed the dish. 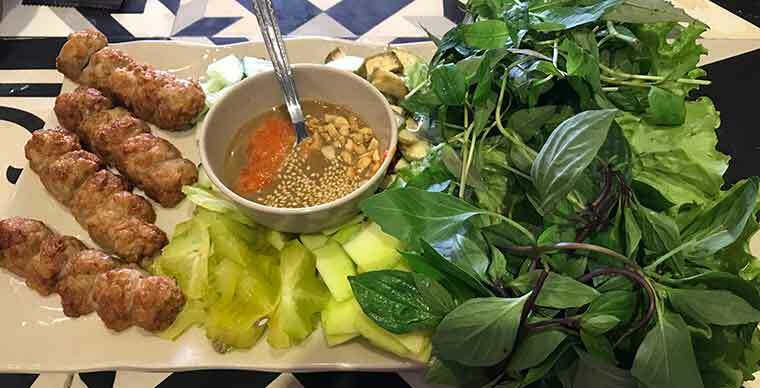 Grilled fish in Hanoi is served with rice noodle and basil, peanuts, onions, dill and a bowl of shrimp sauce which are elaborately prepared or if you could not eat shrimp sauce, you can also ask for fish sauce instead. Fish is the main ingredient, processed mainly from hemibagrus, basa fish and Cat fish. The chef cuts the fish into pieces, fried in oil and then put both the kitchen and the pan on the table for eaters. The eater will put the onion, dill into the pan and stir up. After minutes they can enjoy with rice noodle add some peanuts, herbs and shrimp sauce or fish sauce. 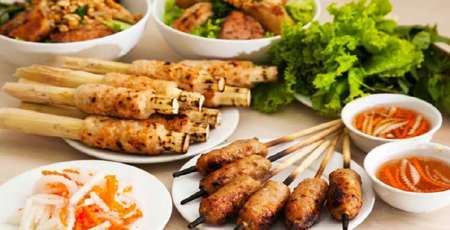 That makes the delicious tast of Hanoi specialties. Cha Ca Thang Long: 19, 21, 31 Duong Thanh Str, Hanoi. Cha Ca Anh Vu: 120 Giang Vo Str, Hanoi. 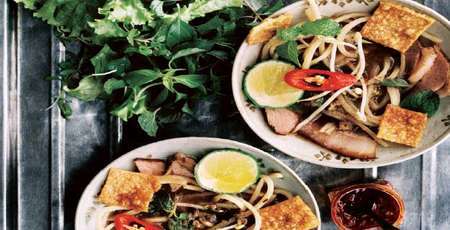 Mentioning a delicious noodle dishes in Hanoi, fish and rice noodle is one of them. Bun Ca Ha Thanh: (4 restaurants) 36b Pham Hong Thai str, 61A Le Van Huu str, 9 Thi Sach Str and 72 Tue Tinh str. The ingredients for making this dish are only the fresh washed crabs, ripped and well pounded, mix well with water, filter to take only the water, then boil the water to make crab meat into solid pieces appearing on the boiling pot. Tofu is fried into the oil. 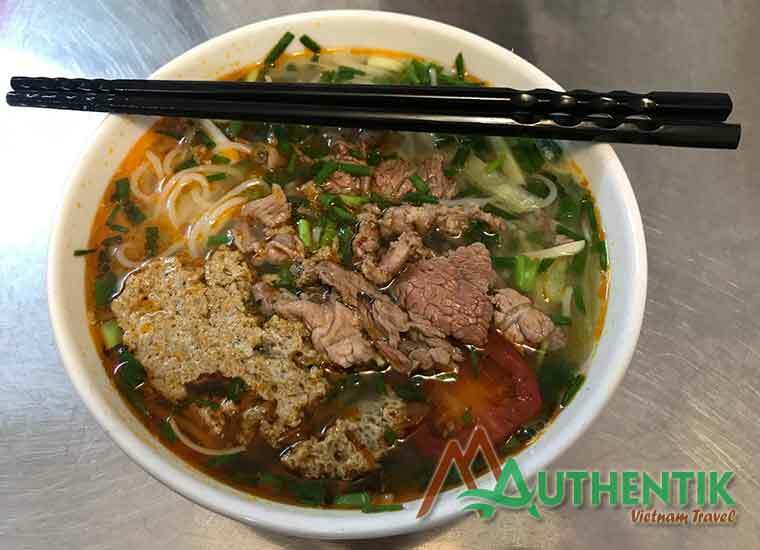 The beef is simply sliced into thin pieced and dipped into the crab soup then served with fresh vegetable and a little of shrimp sauce to make the attractive smelling. Bun Rieu Nguyen Sieu: 32 Nguyen Sieu Str, Hanoi. Bun Rieu Hong Phuc: 23 Hong Phuc Str, Nguyen Trung Truc Hanoi. The stuffed pancake is made from rice flour, thin and soft added cat ear mushroom and some of minced pork meat. 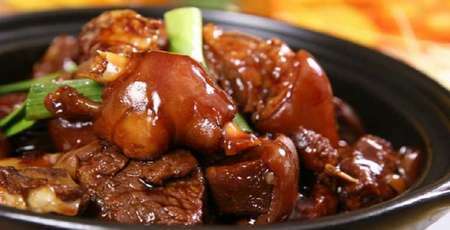 The sauce is very important and it is mixed skillfully in creating a wonderful flavor for the dish. The sauce is a little fish sauce, add sugar, lime, minced chilli, garlic that forms a great balance among salty, sweet, sour and spicy taste. Banh Cuon Mrs Xuan: 16 Hoe Nhai str, Hanoi. 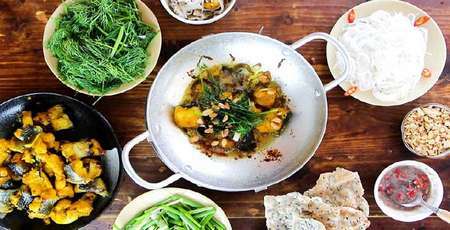 There are still many Hanoi specialities foods. 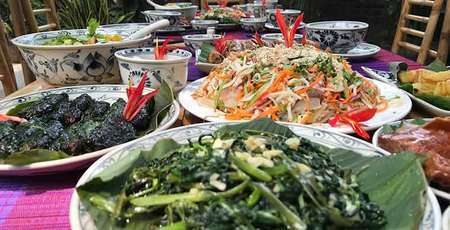 However, above dishes are very popular in Hanoi lifestyle. They could be suitable for any clients from all over the world and they can be replaced for lunch or dinner. Come to visit Hanoi city. 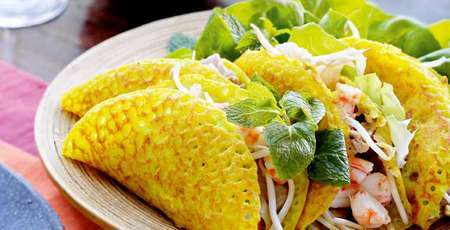 Do not forget enjoying these above Hanoi specialties.